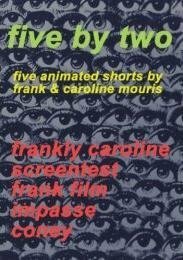 This hard-to-find compilation of five shorts by Frank and Caroline Mouris includes the Academy Award-winning 'Frank Film' alongside companion-piece 'Frankly Caroline', Screentest', 'Coney' and 'Impasse', a homage to Oskar Fischinger. five by two: five animated shorts is a collection of 5 animated shorts by filmmakers Frank and Caroline Mouris. Esteemed as 'probably the most celebrated American short,' Frank Film is a collection of 11,592 collages sequenced to illustrate the chronology of the filmmaker's life. Spanning the years of 1945-1973, this wildly entertaining short film goes beyond the story of one man's existence to become a collective autobiography of our time. More than a quarter century after making Frank Film, Frank finally convinces Caroline that she should tell her life story in FRANKLY CAROLINE. But he insists on 'helping' her and the resulting dialogue between them says just as much about their working/living relationship as it does about her life. In SCREENTEST, a kaleidoscopic portrait of nine people indulging in their favorite fantasies could teach anyone a thing or two. Through a combination of special visual effects and skillful editing, CONEY itself becomes the world's greatest amusement ride that kids of all ages will want to take again and again. IMPASSE is an irresistable force, an immovable object, and a rainbow of brilliant hues create a moral tale made entirely with colorful self-adhesive labels.